Trinity Rose Designs: Your Next Stamp August New Release Blog Hop!!!! Welcome Back Everyone! The day has come!! you can pick up all the August new release Goodies Here! 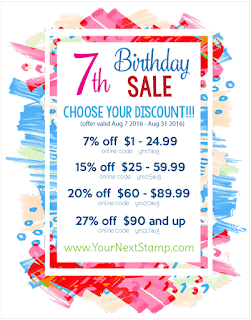 And In case thats not exciting enough for you....We are also having a Sale to Celebrate our Birthday! 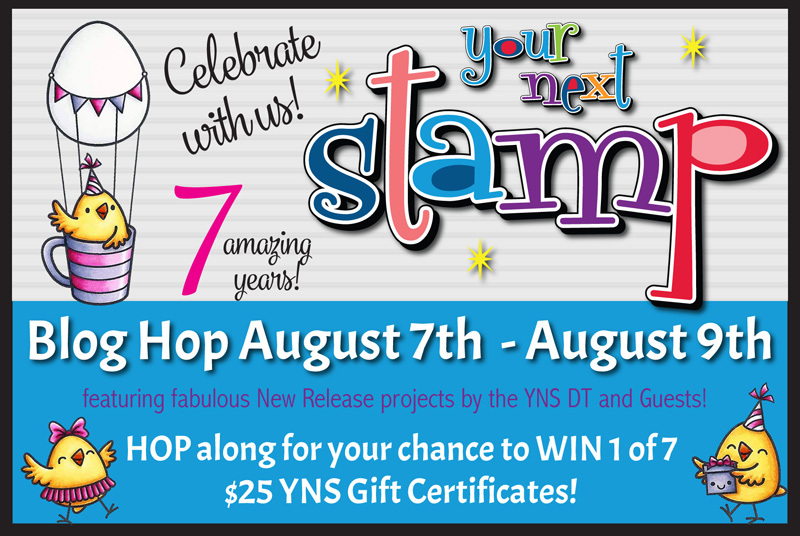 Andddddd if thats not enough we are also giving away SEVEN $25 gift cards to the YNS Store! All you have to do is comment on the Blogs that you will be hopping along, now off course you don't need to comment on all of them, but it will increase your chances of winning and you get to leave a little love as you go! 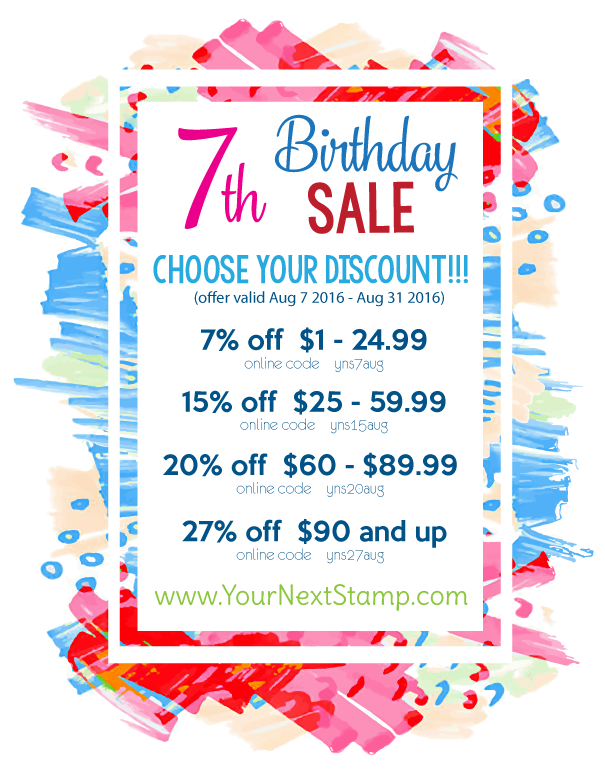 This release is incredible, especially if you love Birthdays as much as I do, and the new Your nExt Stamp Paper Pad?? I can't even contain all my ideas with it! I decided to do a cute little Shaker Baby card with this set! Thank you so much for Hopping by, leave me some love and maybe tell me what your fave set from our august release is! L like the artsy design of the elephant card. FUN! FUN! Your cards are so creative and cute. I really like both of your cards...the cat coloring though is REALLY good! The little kitties are so cute! Ohhhh Martha these are wonderful!!! 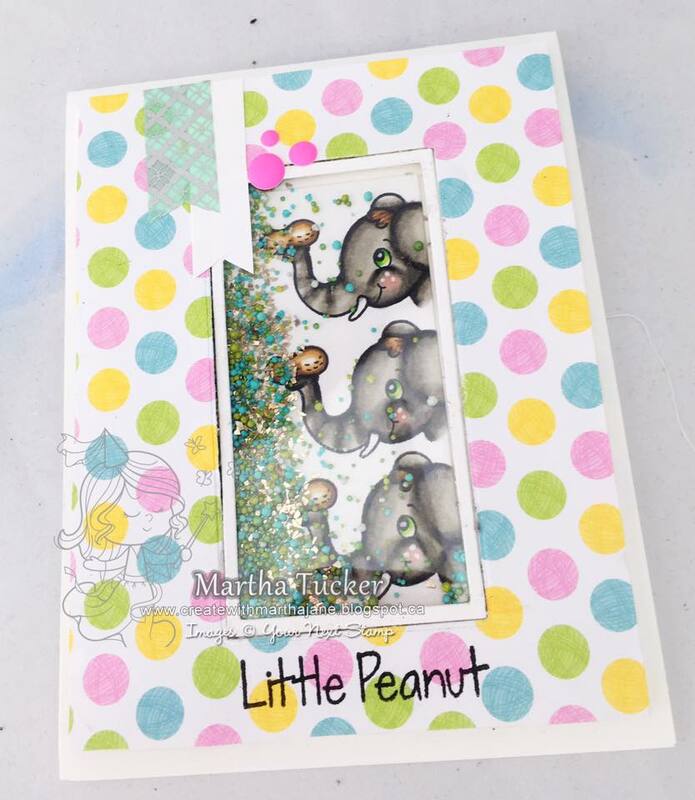 Love how you used the elephant for a baby card - great idea. 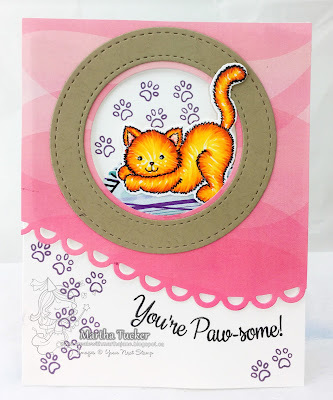 Wonderful design on your kitty card too! Such cute cards - I love them! I think the whole new release is awesome, but if I really had to choose one thing, I think my favourite is te circle background die. And from stamps my favohrite is the bunny with flower hat. He's too cute. 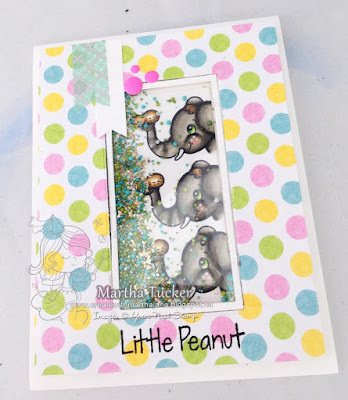 I love how you have the kitty's tail outside the circle and love how you used the elephant in your shaker Martha. Genius. Purr-fect paw some and I love your cute shaker one, what a gr8 release! Sweet kitty, love how you colored it. And the elephant shaker is too fun!! O.M.G. Martha these ARE CUTE! Just plain precious! Great work! Both cards are stunning. Nice job. These are too cute! Your coloring is fabulous. I especially love how you gave texture to the kitty. I love how bright and cheerful your cards are! I don't think I can choose a favorite from the release... maybe the circle panel die? That thing is pretty awesome! Both of your cards are super-cute! I'm excited about these new products! What cute cards! I need to check out that kitten set! Two equally beautiful cards, but I really love your card with the elephants! Your cards are just adorable!!! My wish list is huge!!! Must get the curved scallop edge!! What adorable cards! LOVE the elephant shaker! Happy Birthday YNS!! Your cards are so cute!! Love that kitten card!! Darling cards! Love the kitty! Both cards are adorable! Love the paw-some sentiment. I love shaker cards!! That elephant is soooo cute! Thanks for your ideas! Cute cards - both of them, but, being partial to elephants, just love the baby shaker card. Inspirational. Hi Martha ~ You've knocked these designs out of the park with your a-dor-a-ble cards! The kitten is sweet (and didn't make me sneeze!!) and I totally need that paper pack! What an adorable shaker card you've created as a welcome for a sweet baby. I'm obsessed with shaker cards and this one is awesome! Thanks so much for sharing and inspiring and Happy 7th Birthday to YNS!! Very cute cards. Love that shaker! Such sweet cards Martha! I really like the way you did the paw prints on the first. Happy 7th birthday to Your Next Stamp. What sweet cards and great ideas. Just love your shaker card. Loving the new release. I love your cards,Super cute! Cute cards. congratulations on your 7th celebration. What an adorably kitty and super fun shaker!! Aw, both cards are so cute! Right up my alley! I'm loving the new dies you featured! YNS dies were the first that I bought when I got my machine. They are still my most used. Great touch adding all the paw prints to the cat card and love the elephant shaker. Prr-fectly fun cards. Love both of them. Love the colors and design elements. So cute and well layout!! I love these two adorable cards. Super cute cards. TY for sharing your copic colors used. Very helpful to see new coloring.